Most events take place on the University of Canberra campus in Bruce (campus map); for others we move to city centre locations, the Belconnen Arts Centre, and the National Portrait Gallery. 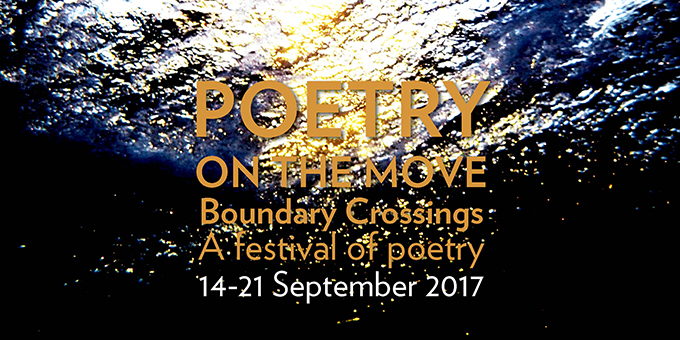 Poetry on the Move is a three-year poetry project hosted by the International Poetry Studies Institute (IPSI) based within the Centre for Creative and Cultural Research (CCCR), Faculty of Arts and Design, University of Canberra. The project explores poetry's ability to move from—and interrogate—its place on the printed page. As part of our international agenda we are delighted to be welcoming, from overseas, two poets in residence: Vahni Capildeo and Glyn Maxwell. Vahni Capildeo is a Trinidadian British writer. Her seven publications include Measures of Expatriation (Carcanet) (Forward Poetry Prizes Best Collection award; T.S. Eliot Prize nomination); Simple Complex Shapes (Shearsman), a sequence completed during the Judith E. Wilson Poetry Fellowship, University of Cambridge; and Utter (Peepal Tree), inspired by her former job as a lexicographer at the Oxford English Dictionary. She enjoys cross-genre writing and interdisciplinary collaboration, and has created performances based on Shakespeare, Euripides, and Guyanese poet Martin Carter. She writes a regular column for PN Review. Her non-fiction has appeared in adda, Commonwealth Writers’ online gathering of new stories. Events: Writing workshop (See Festival Program p6); Measures of Expatriation (See Festival Program p10); Reading (See Festival Program p11); Book launch and reading (See Festival Program p23). Glyn Maxwell has long been regarded as one of Britain’s major poets. His books include Pluto, Hide Now, The Sugar Mile, The Nerve, and his recent selection, One Thousand Nights and Counting. He has won many awards, including the Somerset Maugham Prize, the E.M. Forster Prize from the American Academy of Arts and Letters, and the Geoffrey Faber Memorial Prize. Several of his plays have been staged in the UK and US. He has written several opera libretti, and his novel, Blue Burneau, was shortlisted for the Whitbread First Novel Prize. He has taught at Princeton, Columbia, and New York University, and reviews poetry for The New York Times. Events: Drinks with Dead Poets (See Festival Program p7); Reading (See Festival Program p11); Workshop (See Festival Program p14); Keynote (See Festival Program p18); Reading (See Festival Program p23). Most events take place on the University of Canberra campus in Bruce; for others we move to city centre locations, the Belconnen Arts Centre, and the National Portrait Gallery.